- Simply Tilt to roll balls in different directions. - Press the bubble level to reset the direction of gravity so you can rest your iPhone on any surface and watch the balls fall. 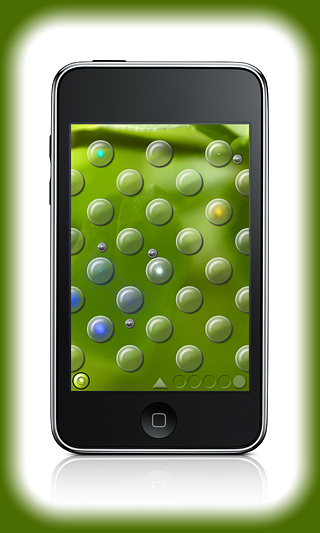 - Touch circles at screen bottom to start up to five balls falling at once! - Touch screen to add or remove bell chimes while balls are falling. - Clear all the balls, then play the chimes yourself by touching them. - Touch the arrow to bring up favorites or customize settings. When two balls hit each other, the chime tones will progress to the next chord or the next key, depending on the musical scale chosen.